On Thanksgiving day, I was trying to see if I could order the iPad online. I couldn’t do it. While there were several listings, based on storage space or color, most were unavailable. The ones that were available, they didn’t stick around long enough to complete the checkout process. I was wondering if I should just go directly to the Best Buy store, just like I did last year. However, 2014 was the year of ebola. I wasn’t really in the mood to stand in the dark and the cold, with hundreds of sniffling and coughing people. Target was also having an iPad Air 2 sale. A $140 gift card was included with the purchase. Since I regularly shop at Target, the gift card was as good as cash. After a quick drive to Target on Black Friday morning, I was in for a surprise. The store seemed quite empty. Where were all the people? Perhaps I missed all of the excitement from the previous day. Was the iPad Air 2 even in stock? I figured the store might be sold out. And at first, that seemed like a strong possibility. Behind a glass case, only stacks of boxes with an “iPad Air” label could be found. I didn’t want the original iPad Air. Where was the iPad Air 2? I’m not sure of Apple’s logic in dropping the number two from the side of the box, but Target did have the iPad Air 2 in stock. They had lots of them, in plenty of different colors. That’s how I was able to spot the difference. The original iPad Air is not available in gold. I picked a more traditional color though – Space Gray. The idea behind the purchase of a new iPad was that I’d be more productive. Maybe I’d write more books. Maybe I’d make cool music for my video games. Unfortunately, that’s not how it worked out. I’m just not as productive with a tablet as I am with a desktop. That’s why, back in 2012, I returned the original iPad Mini. Pages just didn’t work out the way that I expected. I wasn’t comfortable typing on a glass screen. But two years later, I have a much more powerful iPad for about the same price as the original iPad Mini. The second time around not much had changed, at least not at first. My iPad Air 2, was more powerful – at collecting dust. The novelty wore off quick. This Christmas gift was going unused before the holiday even got here. But then, something changed. I downloaded Asphalt 8. This game was incredibly fun to play. The iPad Air 2 has pretty good battery life, but I drained it while playing this game. The best part was being able to drive a Tesla Model S. Considering that the starting price for a new Tesla is around $71,000, and that’s without the cool dual motor option, it was about as close as I could get at the moment. 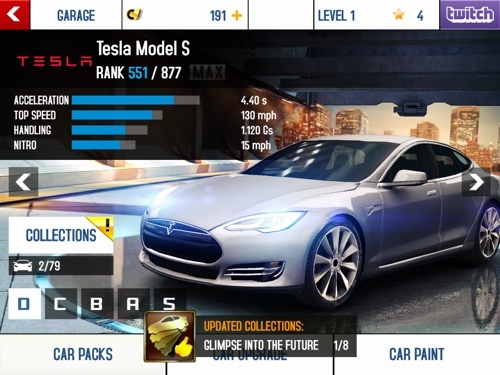 Asphalt 8 has great graphics and fun multiplayer action. It felt like true console level gaming on a tablet. Previous Previous post: Where’s the Turkey / Thanksgiving Emoji?